In recent years more and more Indian Students have been going overseas for Undergraduate or Bachelor programs. We at Edwise have always been assisting these younger students who need more help and assistance with their application process as compared to the senior students. Even though some institutions in India assist these students several of them are helped by Edwise. Some countries like UK and USA have a common application process but it is still advisable to seek counselling from Edwise before proceeding with your application. Students also will develop character and confidence due to living independently. The networking opportunities too are limitless. In our opinion 50% of the learnings while studying abroad are from outside classroom and 50% in the classroom. A traditionally accepted world class education destination offers qualifications and degrees that can make a real difference to your career at the undergraduate level. UK Bachelors degrees are generally of 3 years duration with some subjects taking upto 4/5 years like Engineering programs. Also incorporated in certain degrees are provisions to work in the industry for a year- such degrees are called Sandwich programs. A very pertinant point regarding the degree programs at UK Universities is that their admission process is centralized and processed through a body called Universities & Colleges Admission Services(UCAS). UCAS has certain deadlines which the student needs to be aware if interested in applying. Students can also study vocational & technical programs as diplomas, Certificates and foundation Degrees such as Higher National Certificate - 1 yr and Higher National Diploma - 2 yrs (HND/HNC). These are typically 1 or 2 years. Students should contact Edwise before submitting the UCAS form. Edwise can also assist with direct applications for UG programs. 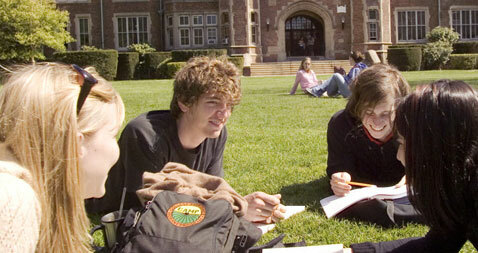 US is one of the favored destinations of choice for international students who wish to study UG abroad. USA has nearly 4000 universities to choose from. She offers a wide range of degrees and programs at the undergraduate and post graduate level. The US boasts of some of the best colleges and programs in the world. For admission at the undergraduate level, the Indian student has to complete 12 years of education. A SAT (Scholastic Aptitude Test) test needs to be taken depending upon the university requirement. The undergraduate coursework enables students's allround development. The degree is obtained in 4 years. The first two years have common syllabus while the next two years allow student to choose from various concentrations. Scholarships ranging from 1000 to 30,000 dollars or above are available to qualified students depending upon the university and program. Students can participate in various activities through on campus clubs and organizations. There is also opportunity for on-campus employment, co-op programs and internships. The undergraduate coursework nurtures students through experiential education after which they either opt for jobs in the US, or pursue higher education. Contact Edwise to help you get a scholarship for your Bachelors Program. Canada's education system is excellent and ranks among the best in the world. A Degree or Diploma from a Canadian University or College is internationally recognized. Canadians spend more per capita on their education system than any other country in the commonwealth. Education institutions are not officially ranked in Canada, as all Canadian institutions offer high quality programs. Canadian institutions are both public funded and private colleges which include Community colleges/Technical Institutes, Career Colleges, University Colleges or Universities. Indian students after 12th can opt for either any 2/3 years Diploma or 4 years Bachelors Degree. Due to government funding the tuition fees are amongst the lowest when compared to the other countries. The Post Graduation Work Visa allows students graduating from any post secondary institutes to apply for their work visa upto 3 years depending on the duration of their course. Under this work permit the student can work for any Canadian employer in any field or industry. During this 3 years period they can apply for Permanent Residency under the Canadian Experience Class. Edwise represents a diverse range of Institutions in Canada which are geographically dispersed throughout Canada. There are many factors that contribute to the popularity of Australia as a study abroad destination, with the low cost of living and tuition fees and excellent lifestyle and weather being important contributors Australia can definitely be considered for undergraduate education.The basis of the Australian university qualification is the bachelor degree. It usually consists of three years of study. Some Engineering programs are of 4 years duration. The student has the choice of choosing from about 2500 different variants/combination of courses according to his/her likening. All the courses of study within Australia come under the scope of the Australian Qualifications Framework (AQF) which simplifies the process of evaluation of the levels of study in all the universities, vocational education and training institutions and schools across Australia. The AQF allows you to move from one level of study to another. For example a student with low scores can still get in to the higher ranked university through foundation or bridging programs. At the same time the student has got the choice to exit at different levels of his bachelors and continue into another program of his choice. Edwise can assist you with admissions to all the 41 universities in Australia. New Zealand programmes offer excellent value for money. It has more than 25-state funded and NZQA approved institutes which offer certificates/ diploma programs. The cost for education is relatively low compared to other countries. The undergraduate programs cost approx. 5.0 lacs to 6 lacs. It offers wide range of subjects including popular streams like arts,Business and science as well as in specialties like Culinary Arts, Hospitality &Tourism, Wine making, engineering, Information Technology, Graphic design, 3D Animation,Sports & Recreation,Communication studies etc. Edwise is a founder member of NZIER and represents all the 8 universities and 22 polytechnics in NZ. Bachelors degree programmes are offered in almost every subject from pure science ,economics to engineering ,architecture and business management . Admission in Public University are competitive, primarily based on academic profile. International students interested in pursuing undergraduate studies in Public university must have completed at least 12 years of general education in order to be considered for admission. The duration of the bachelors course is 3years to 4 years. Some of the programmes require SAT for Undergraduate programmes but this differs with each university. Submission of TOEFL and IELTS scores are optional. Application for the undergraduate programmes is done online. Bachelors Degree in Private Institutes: The Private Institutes offer bachelors Degree programmes in almost every subject.The admission requirement vary from programme to programme. the SAT,TOEFL and IELTS are optional for admission .The students completed their 12th or 11th std or equivalent to Singapore A level can apply for the bachelor degree in Private institutes. Edwise represents several top private institutions in Singapore and can assist with admissions to the public universities too.